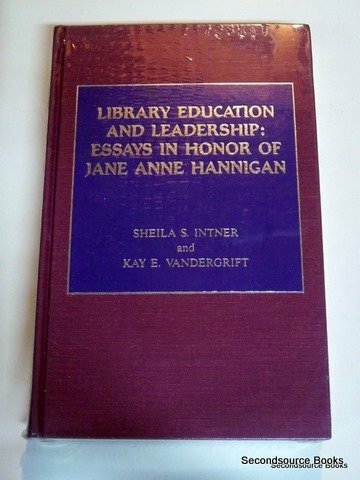 Jane Anne Hannigan's greatest contributions to the profession have been as a library educator, first at Simmons College Graduate School of Library and Information Science and then at the School of Library Service, Columbia University. She has been active in workshops, institutes, and consulting activities and in the ALA. After her retirement from full-time teaching, she has continued to exert her influence on the profession as a part-time visiting professor at the School of Communication, Information and Library Studies, Rutgers University, by speaking, consulting and leading workshops throughout the country, by editing Scarecrow's Library Lit. series, and by serving as an active member of ALISE and ALA and on the 1991 Newbery Award Committee. The content of this festschrift reflects the eclecticism and the questioning spirit so typical of the person it honors. The editors' aims were to honor Jane Anne Hannigan and to put before the profession a number of critical questions they believe needed to be addressed. Among the 36 contributors are Patricia Glass Schuman, James M. Matarazzo, Daniel O. O'Connor, Peggy Sullivan, Norman Horrocks, Nicole St. John (Norma Johnston), Lillian N. Gerhardt, Lucille Thomas, and the editors.